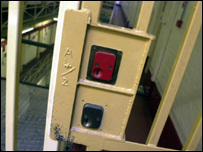 Two of Kent's prisons have been named among Britain's suicide blackspots, a prison reform charity has said. Canterbury and Elmley prisons are among a list of 35 of the most overcrowded jails in the UK, according to the Howard League for Penal Reform. The group highlighted a report by the Chief Inspector of Prisons which found Canterbury prisoners having to share small cells with unscreened toilets. The campaign group claims cramped conditions make inmates more likely to kill themselves. The report showed 90 deaths out of a total of 159 suicide cases since January last year had been concentrated in the 35 most overcrowded prisons. Canterbury Prison was built in 1808 as a county jail but now holds around 300 short-term category C prisoners. Elmley Prison on the Isle of Sheppey opened in 1992 and houses up to 171 prisoners in the four main house blocks and another 240 in another unit.